I recently visited one of the most extraordinary places on earth. Meteor Crater or Barringer Meteor Crater is located just west of Winslow, Arizona and east of Flagstaff off Interstate 40. About 50,000 years ago this area was an unbroken plain. An asteroid streaking at 26,000 miles per hour was on an intercept course with the earth. It passed through the atmosphere with almost no loss of speed or mass. It was about 150 feet across and weighed several hundred thousand tons. Striking the plains it created a crater 700 feet deep and over 4000 feet across, all this in 10 seconds. Today this is the best preserved and first proven meteorite impact site on earth. Relatively speaking this was a very small object that hit the earth. One can only imagine the result of a much larger asteroid strike. By the way when they are in space these objects are called asteroids, but once they enter the atmosphere or impact they become meteors or meteorites. Shooting stars that you see in the night sky are meteors burning up in our atmosphere, if they pass through the atmosphere and actually strike the earth they become meteorites. 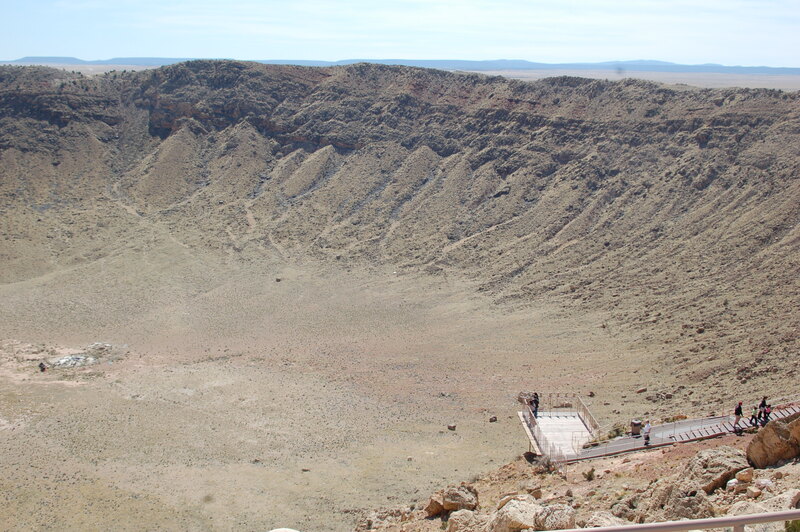 If a 60 story building was on the bottom of the crater the top would not extend above the rim. Twenty football games could be played simultaneously on the crater floor, while more than two million fans watched from the sloping sides. The Washington monument placed on the bottom would have its top at your eye level as you stood on the rim. Native Americans spoke of the crater, but the first written account wasn’t until 1871 from one of General Custer’s scouts named Franklin. It was referred to as Franklin’s Hole for years. It was thought to be just another extinct volcano. In 1886 iron-nickel meteorites were found. These led to the belief that the crater might have been formed by a giant meteorite. It wasn’t until 1902 that a mining engineer named Daniel Barringer visited and was convinced it was the impact site of a meteorite. The crater is located on private land, but in 1968 Meteor Crater was designated a Natural Landmark by the US Department of the Interior. The visitor centre has fascinating exhibits concerning asteroid strikes all over the world including on-going attempts at early detection of those which may strike the earth. There is an film illustrating the strike of this particular asteroid. The largest piece recovered from the meteor is also on display. It’s about 4 feet in length and consists of iron. Most of the meteor disintegrated upon impact. On-site is the Discovery Center, Gift & Rock Shop, rest rooms and a Subway outlet. At the intersection of I-40 and access road (exit 233)there is an RV park, country store and gas station. It is open year round including the RV park, but check the website for seasonal hours. My son and I were in awe and fascinated by this natural attraction. It gave me lots to think about, like what happens if a huge asteroid or comet hits the earth. The one that streaked through Russian skies last year causing many injuries and extensive damage was not detected beforehand. That’s scary. I visited this park in March 2014. The park is located at the base of the rugged Sangre de Cristo Mountains in south-central Colorado. It is west of Interstate 25, north of US Highway 160, and east of Colorado 17. Access into the park is excellent, but is a little off the beaten track. It’s well worth the drive. 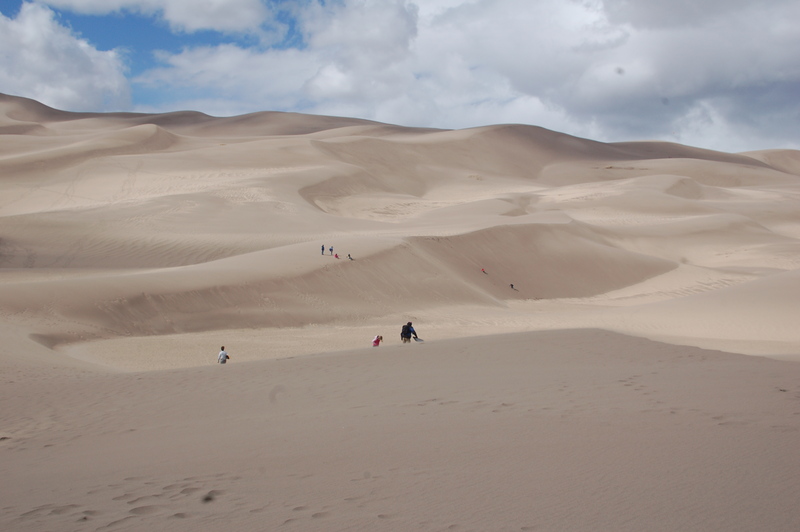 The huge dunes, North America’s tallest, are the focal point of this park. It was a surreal experience. One could almost visualize being in the Sahara Desert. Star Dune at 755 feet (230 metres) is the tallest in the park. At a close second is High Dune at 699 feet (213 metres). Evidence shows that humans have lived in the area for 11,000 years. In historic times Southern Ute, Jicarilla Apache, Navajo, gold miners, homesteaders, ranchers, and farmers have lived here. The dunes are a source of local pride and tourist income. By the 1920s valley residents petitioned for protection of the area. In 1932 it was designated national monument status under the Antiquities Act. Finally in 2000 the dunes and surrounding area became a national park and preserve. The park facilities include a visitor/interpretive centre, hiking trails, picnic areas and campgrounds. When we visited it was still cool and jackets were a necessity. In summer though the temperature can reach into the 100s F (40s C). Climbing the dunes is an experience not to be missed, even if you only go part of the way. Carry lots of water and a jacket. A good pair of athletic shoes is all you need, but be prepared to get sand in your shoes. From the visitor centre you have to walk a couple of hundred yards across a flat, beach-like area to get to the dunes. Being on the dunes is like being in an alien world. As a photographer I was challenged to take the time to find new perspectives, it cries out for a picture every time you look around. It’s possible to slide down the dunes on boards similar to snow boards, these can be rented at a store a short distance outside the park entrance. The ranger told me that normal toboggans, snow boards, or saucers won’t work on the sand. Something about the consistency and make up of it. My son met some kids who let him try it and he was thrilled. They were from Colorado and told us they came here often to try out their skills. The dunes are steep, but forgiving if you fall, you’ll be filled with sand but not injuries. If you’re looking for an unusual experience then this park is a must. You are currently browsing the WRITINGS & RAMBLINGS blog archives for April, 2014.